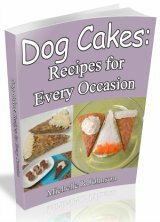 I make homemade treats for my dogs at home. I use real meat, but the treats can spoil (mold) after 7 days or more when sitting on my counter. I don’t want to refrigerate them; I want to add a natural preservative to give the treats more shelf life. Is there a natural preservative safe for dogs that I can ad? If so what ingredient would that be? Thank you for your time. Chef's Answer ~ One option is to freeze the treats to help them last longer. But, if you want a natural preservative, I would recommend K9 Cakery.com. They have all kinds of dog safe mixes, icings and tools for making homemade dog treats.